Thống kê các báo cáo khoa học được trình bày tại các hội thảo và hội nghị quốc tế (Từ năm 1996 đến năm 2017). 1. Lai Van Lam, Pham Thanh Tinh, Pham Thi Dung, Le Mau Tuy and Ngo Van Hoang (1996). Intercropping with Hevea in Vietnam. IRRDB workshop on farming system aspects of the cultivation of natural rubber (Hevea brasiliensis), Bruwela, Sri Lanka, 6 November 1996. 2. Do Kim Thanh (1997). Review of dryness incidence in exploitation trials. Workshop on Tapping Panel Dryness in Hevea Brasiliensis, Hainan, China, 29 - 30 April, 1997. 3. Phan Thanh Dung, Nguyen Thai Hoan (1999). Corynespora leaf fall on rubber in Vietnam: New record. IRRDB workshop, Hainan, China, 10/1999. 4. Phan Thanh Dung and Nguyen Thai Hoan (2000). Current status of Corynespora leaf fall on rubber in Vietnam. In International Rubber Research and Development Board’s Workshop on Corynespora Leaf Fall of Rubber, Malaysia and Indonesia, 6-14 June 2000. 5. Tran Thi Thuy Hoa, Le Mau Tuy, Pham Hai Duong and Lai Van Lam (2001). Performance of promising clones in sub-optimal zones of Vietnam. International Conference on the future of perennial crops. Yamousoukro, Cote d' Ivoire. 6. Tong Viet Thinh, Ngo Thi Hong Van and Tran Nam Viet (2002). Inorganic NPK fertilizers for rubber on marginal land in central highlands of Vietnam. IRRDB joint workshop on breeding, agronomy and socio-economy in Malaysia and Indonesia, 28 Aug. - 07 Sep. 2002. 7. Tran Thi Thuy Hoa, Le Mau Tuy, Pham Hai Duong, Vu Van Truong and Truong Tan Hai (2002). Characteristics of rubber clones recommended in Vietnam for 2002-2005. The IRRDB Workshop on Breeding, Agroforestry and Soci-Economy, Kuala Lumpur & Medan, 28 Aug.
8. Le Mau Tuy, Le Hoang Ngoc Anh, Le Thi Thuy Trang and Tran Thi Thuy Hoa (2002). Assessment of Corynespora leaf disease on rubber hand pollinated progenies in early selection trials. The IRRDB Workshop on Breeding, Agroforestry and Soci-Economy, Kuala Lumpur & Medan, 28 Aug.
9. Lai Van Lam, Huynh Bao Lam, Le Thi Thuy Trang (2002). Status report of the IRRDB’81 Hevea germplasm in Vietnam. IRRDB Joint workshop on Plant Breeding, Agronomy and Socio-Economy. Malaysia and Indonesia, 28 Aug - Sep. 2002. 10. Mai Van Son (2003). Development of the NR industry in Vietnam. International Natural Rubber Conference, Chiangmai, Thailand. 11. Vu Van Truong, Lai Van Lam, Le Mau Tuy and Tran Thi Thuy Hoa (2003). An appoach for estimation of wood volume of the main stem of rubber stands. Workshop on Rubber Wood, Cropping and Research, 12-14 November 2003 - RWCR - Bangkok, Thailand. 12. Do Kim Thanh and Kim Thi Thuy (2003). Hevea clonal Typology: Latex Physiology Parameters and Clonal Grouping by Principal Components Analysis. International workshop on exploitation technology, 15-18 December 2003, India. 13. Le Mau Tuy, Vu Van Truong and Tran Thi Thuy Hoa (2003). Field recording and observation on final stage in selection of rubber clones. International workshop on exploitation technology, 15-18 December 2003, India. 14. Phan Dinh Thao, Do Kim Thanh and Nguyen Ngoc Kieng (2003). Establisment of yield prediction model for GT1 and PB235. International workshop on exploitation technology, 15-18 December 2003, India. 15. Tran Thi Thuy Hoa, Le Mau Tuy, Le Hoang Ngoc Anh, Le Thi Thuy Trang and Ngo Van Hoang (2003). Rubber breeding programme for latex-timber clones in Vietnam. Workshop on Rubber wood, cropping, research. 12-14 Nov. 2003. Kasetsart Univ. Bangkok. 16. Vu Van Truong, Lai Van Lam, Le Mau Tuy and Tran Thi Thuy Hoa (2003). An approach for estimation of wood volume of the main stem of rubber stands. Workshop on Rubber wood, cropping, research. 12-14 Nov. 2003. Kasetsart Univ. Bangkok. 17. Nguyen Anh Nghia (2004) Cuontry report, Vietnam. In: Chow KS & Yeang HY (eds). Report on the International Rubber Research and Development Board, Biotechnology Workshop, Sungei Buloh, Malaysia, 9-11 Feb 2004. 18. Le Mau Tuy, Le Hoang Ngoc Anh and Tran Thi Thuy Hoa (2005). Estimation of general combiming ability for the 1987-1995 Hevea breeding program at the Rubber Research Institute of Vietnam. International Natural Rubber Conference, India. 19. Lai Van Lam, Vu Van Truong, Le Mau Tuy and Tran Thanh (2005). Wood potentials of the IRRDB’81 Hevea Germplasm. Second workshop on Rubber Wood, Cropping and Research, 25-27 May 2005 - RWCR - Bangkok, Thailand. 20. Tran Thi Thuy Hoa, Vu Van Truong, Le Mau Tuy and Lai Van Lam (2005). Selection of Hevea clones for latex-timber and timber purposes in RRIV. Workshop on Rubber wood, cropping, research. 25 – 27 May 2005. Kasetsart Univ. Bangkok. 21. Le Mau Tuy, Le Hoang Ngoc Anh and Tran Thi Thuy Hoa (2005). Estimation of General combining ability for the 1987-1995 Hevea Breeding program at the Rubber Research Institute of Vietnam. International Natural Rubber Conference, India. 22. Tri, T.M. and Bich, N.N. (2005) Feasibility of Solar Photocatalysis in the Treatment of Rubber Processing Wastewater. International Natural Rubber Conference, India. 23. Le Gia Trung Phuc (2006). Rubber - based farming systems applicable for immature smallholdings in highland and central coastal regions of Vietnam. Workshop on rubber development in Laos: Exploiring improved systems for smallholder production, 9-11 May 2006. 24. Do Kim Thanh, Nguyen Thi Hoang Van, Nguyen Nang, Nguyen Thi Hue Thanh and S. Sivakumaran (2006). Preliminary results of the application of ethylene gas stimulation (RRIMFLOW) in Vietnam. International Rubber Conference, 13-14 November 2006, Ho Chi Minh city, Vietnam. 25. Phan Dinh Thao, Do Kim Thanh, Nguyen Ngoc Kieng and Mai Van Son (2006). Establishment of yield prediction model for GT 1 and PB 235. International Rubber Conference, 13-14 November 2006, Ho Chi Minh city, Vietnam. 26. Tong Viet Thinh (2006). Effectiveness of inogarnic N, P and K fertilizers on latex yield on red bazaltic soil in highlands, Vietnam. International Rubber Conference, 13-14 November 2006, Ho Chi Minh city, Vietnam. 27. Lai Van Lam, Le Mau Tuy, Tran Thi Thuy Hoa and Le Hoang Ngoc Anh (2006). Potential of the IRRDB’81 gerplasm in Hevea breeding program. International Rubber Conference, 13-14 November 2006, Ho Chi Minh city, Vietnam. 28. Le Mau Tuy, Vu Van Truong, Le Dinh Vinh and Tran Thi Thuy Hoa (2006). Performances of new promising Vietnamese rubber clones. International Rubber Conference, 13-14 November 2006, Ho Chi Minh city, Vietnam. 29. Vu Van Truong, Lai Van Lam and Le Mau Tuy (2006). Potential of the IRRDB’81 Hevea resource for timber production. International Rubber Conference, 13-14 November 2006, Ho Chi Minh city, Vietnam. 30. Phan Thanh Dung, Vi Van Toan, Tran Anh Pha and Dam Van Chon (2006). Brown root disease on rubber, first outbreack and it’s control in Vietnam. International Rubber Conference, 13-14 November 2006, Ho Chi Minh city, Vietnam. 31. Nguyen Ngoc Bich (2006). Wastewater reduction in the processing of technically specified rubber from latex. International Rubber Conference, 13-14 November 2006, Ho Chi Minh city, Vietnam. 32. Do Kim Thanh, Nguyen Quoc Cuong and Nguyen Duc Tin (2007). Yield performance of controled upward tapping systems in relation to tree, land and labour productivity. International Rubber Conference, 12-13 November 2007, Siem Reap, Cambodia. 33. Lai Van Lam, Le Mau Tuy, Le Hoang Ngoc Anh and Vu Van Truong (2007). Early selection of IRRDB’81 x W clones for resistance to Oidium leaf disease. International Rubber Conference, 12-13 November 2007, Siem Reap, Cambodia. 34. Lai Van Lam, Tran Thanh, Vu Thi Quynh Chi and Le Mau Tuy (2007). Genetic diversity of Hevea IRRDB’81 collection assessed by RAPD markers. International Rubber Conference, 12-13 November 2007, Siem Reap, Cambodia. 35. Nguyen Thanh Binh, Hoa Thien Hai and Tran Van Thanh (2007). Using Geographic Information System (GIS) to investigate natural rubber yield (Hevea brasiliensis) in conjuntion with soil fertility: A case study from Cam My rubber plantation, South-Eastern of Vietnam. International Rubber Conference, 12-13 November 2007, Siem Reap, Cambodia. 36. Nguyen Anh Nghia, Jugah Kadir, Adam Malik, Mohd. Puad Abdullah, E. Sunderasan, Suhaimi Napis (2007). Differentiating races of Corynespora Cassiicola isolated from Hevea plantations in Malaysia using Inter Simple Sequence Repeat (ISSR) markers. International Rubber Conference, 12-13 November 2007, Siem Reap, Cambodia. 37. Nguyen Ngoc Bich, Nguyen Thanh Binh (2007). Prelimitary result on the potential of ozonation in the treatment of rubber processing wastewater. International Rubber Conference, 12-13 November 2007, Siem Reap, Cambodia. 38. Do Kim Thanh, Nguyen Anh Nghia, Nguyen Tan Duc and Nguyen Van My (2008). Recent recommendations of latex harvesting technology and updating on newly adopted techniques in Vietnam rubber industry. IRRDB workshop on latex harvesting technologies, 5-8 May 2008, Malaysia. 39. Do Kim Thanh, Nguyen Quoc Cuong and Nguyen Duc Tin (2008). Outlook of panel planning for controlled upward tapping. IRRDB workshop on latex harvesting technologies, 5-8 May 2008, Malaysia. 40. Le Mau Tuy, Vu Van Truong and Le Dinh Vinh (2008). The Adaptation of rubber clones in northern reion of Vietnam. IRRDB Natural Rubber Conference, 13-15 October 2008, Malaysia. 41. Lai Van Lam, Le Hoang Ngoc Anh and Le Mau Tuy (2008). Results of recent early selection trials (2001-2005) at Rubber Research Institute of Vietnam. IRRDB Natural Rubber Conference, 13-15 October 2008, Malaysia. 42. Nguyen Thai Hoan, Le Dinh Don and Phan Thanh Dung (2008). The pathogenicity on Hevea clone RRIV4 of Corticium Salmonicolor derived from different hosts. IRRDB Natural Rubber Conference, 13-15 October 2008, Malaysia. 43. Le Mau Tuy (2008). Hevea breeding in rubber research institute of Vietnam: Recent achievement. International workshop on rubber planting materials. 28-29 October 2008. Indonesia. 44. Phan Thanh Dung and Ha Van Khuong (2009). The role of new technologies in development of NR industry in Vietnam. Treansfer of Technology Workshop. Malaysia, August 2009. 45. Huynh Tan Phat, Tran Le Hai, Nguyen Thi Hue Trang and Nguyen Vinh Tri (2009). Research in rubber composition forimproving tire sidewll properties. IRRDB International Rubber Technology Seminar. Ho Chi Minh city, 15 - 16 December 2009. 46. Nguyen Ngoc Bich, Nguyen Thi Hue Trang (2009). Rising methods for the removal of extractable protein fromnatural rubber latex films. IRRDB International Rubber Technology Seminar. Ho Chi Minh city, 15 - 16 December 2009. 47. Nguyen Quang Duy, Nguyen Ngoc Bich (2009). Nanocomposite from natural rubber latex and organoclay by dispersion destabilisation. IRRDB International Rubber Technology Seminar. Ho Chi Minh city, 15 - 16 December 2009. 48. Do Kim Thanh (2009). 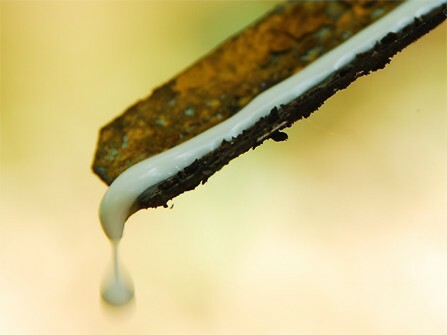 Transfer of latex harvest technology in Vietnam: A case study of gaseous stimulation. IRRDB Natuaral Rubber Conference. Indonesia, 2009. 49. Tran Anh Pha, Phan Thanh Dung, Nguyen Don Hieu and Nguyen Anh Nghia (2009). Disease caused by Botryodiplodia Theobromae Pat. on rubber tree in Vietnam.IRRDB Natuaral Rubber Conference. Indonesia, 2009. 50. Le Mau Tuy (2009). Cold damage to rubber tree in northern Vietnam in early 2008. IRRDB Natuaral Rubber Conference. Indonesia, 2009. 51. Nguyen Anh Nghia (2010). Molecular approaches to diferrentiate Corynespora races. Seminar on Economically Important Diseases of the Hevea Rubber Tree. Malaysia, 1-2 April 2010. 52. Nguyen Anh Nghia (2010).Corynespora rubber leaf fall disease in Vietnam. Seminar on Economically Important Diseases of the Hevea Rubber Tree. Malaysia, 1-2 April 2010. 53. Nguyen Anh Nghia (2010)Incidence of Pink Disease of Rubber in Vietnam. Seminar on Economically Important Diseases of the Hevea Rubber Tree. Malaysia, 1-2 April 2010. 54. Do Kim Thanh and Nguyen Quoc Cuong (2010). Investigation of tapping panel dryness on rubber clones in relation to latex physiological parameters. International worshop on climate change and rubber cultivation: R & D priorities. Kottayam, Kerala, India. 28-30 July, 2010. 55. Nguyen Thanh Binh, Do Kim Thanh and Nguyen Quoc Cuong (2010. GIS – Based investigation of TPD status of natural rubber tree under varying soil conditions. International worshop on climate change and rubber cultivation: R & D priorities. Kottayam, Kerala, India. 28-30 July, 2010. 56. Lai Van Lam, Le Thi Thuy Trang, , Huynh Thi Minh Tam, Huynh Duc Dinh and Le Mau Tuy (2010). Genetic Variability of the Hevea WA Hybrids Derived from Five Controlled- pollinated Crosses Determined by RAPD Analysis. IRRDB Natuaral Rubber Conference. China, 2010. 57. Nguyen Anh Nghia, Duong Ngoc Kieu Thi and Phan Thanh Dung (2010). Ribosomal DNA ITS (rDNA ITS) Sequencing and Inter Simple Sequence Repeat (ISSR) Markers Analyses of Corynespora cassiicola Isolates from Rubber Plantations in Vietnam. IRRDB Natuaral Rubber Conference. China, 2010. 58. Le Mau Tuy, Kim Thi Thuy and Le Dinh Vinh (2010). Correlation among Juvenile and Mature Performances and Selection of Elite Rubber Clones in the Small Scale Clonal Trial. IRRDB Natuaral Rubber Conference. China, 2010. 59. Nguyen Thanh Binh, Do Kim Thanh and Nguyen Quoc Cuong (2010). 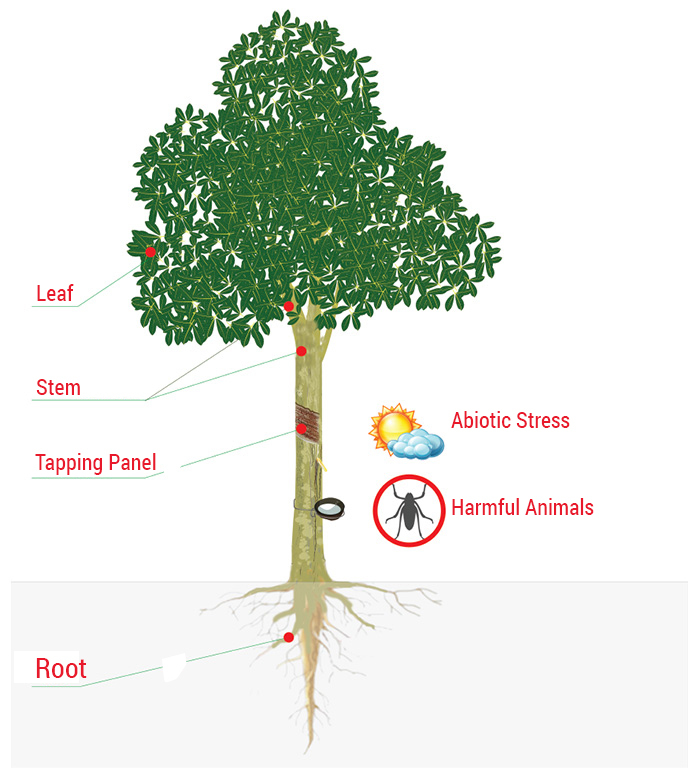 GIS – Based Investigation Of TPD Status of Natural Rubber Tree Under Varying Soil Conditions. IRRDB Natuaral Rubber Conference. China, 2010. 60. Nguyen Ngoc Bich (2010). The Treatment of Natural Rubber Processing Effluent in the Context of Climate Change. IRRDB Natuaral Rubber Conference. China, 2010. 61. Nguyen Ngoc Bich, Nguyen Thi Hue Trang (2010). Evaluation of incubation and rinsing methods for the removal of extractable protein from natural rubber latex concentate and its product. Proceedings of Asian workshop on polymer processing in Vietnam. December 7-10, 2010, Hanoi, Vietnam. 62. Le Mau Tuy (2011). Genetic Variability of the Hevea Germplasm and the W x A Progeny Determined by RAPD Analysis. IRRDB Plant Breeder Seminar, Brazil, April 4-7th 2011. 63. Nguyen Anh Nghia, Nguyen Don Hieu and Phan Thanh Dung (2011). Molecular analysis of Corynespora cassiicola Isolates from Rubber Tree and Some Other Hosts in Vietnam Using rDNA ITS Sequencing and ISSR Markers. IRRDB Biotechnology Workshop. 30 May – 1 June 2011. Kuala Lumpur, Malaysia. 64. Le Mau Tuy, Vu Van Truong, Le Hoang Ngoc Anh, Le Dinh Vinh and Lai Van Lam (2011). Performances of elite RRIV’s clones derived from 1994 hand pollination program. IRRDB International Rubber Conference. Chiangmai, Thailand, 2011. 65. Phan Thanh Dung and Nguyen Anh Nghia (2011). Corynespora leaf fall on rubber in Vietnam - Current status and recent studies. IRRDB International Rubber Conference. Chiangmai, Thailand, 2011. 66. Tran Anh Pha, Phan Thanh Dung, Nguyen Don Hieu, Nguyen Ngoc Mai, and Nguyen Anh Nghia (2011). Disease caused by botryodiplodia theobromea pat on rubber tree in vietnam: Current status and recent studies. IRRDB International Rubber Conference. Chiangmai, Thailand, 2011. 67. Hoang Thi Lieu, Le Thi Thuy Trang, Lai Van Lam and Le Mau Tuy (2011). Identification of rubber clones (Hevea brasiliensis) using inter simple sequence repeat (ISSR) markers. IRRDB International Rubber Conference. Chiangmai, Thailand, 2011. 68. Nguyen Don Hieu, Nguyen Anh Nghia, Vu Thi Quynh Chi and Phan Thanh Dung (2011). Pathogenicity assay of Corynespora Cassiicola isolates from rubber tree and other hosts in Vietnam. IRRDB International Rubber Conference. Chiangmai, Thailand, 2011. 69. Nguyen Ngoc Bich (2011). Swim-bed reactor for COD and nitrgen removal in the treatment of latex concentrate wastewater. IRRDB International Rubber Conference. Chiangmai, Thailand, 2011. 70. T. H. Khang, Z. M. Ariff (2011). Simulation of the filling and curing phases in injection moulding process of natural rubber compound. National symposium on polymeric material 2011, Universiti teknologi Malaysia, Malaysia. 71. Le Mau Tuy, Vu Van Truong, Le Dinh Vinh, Vu Van Chien, Tran Thanh and Lai Van Lam (2012). Performances of RRIV’s clones in non-traditional rubber growing regions of Vietnam. International Rubber Conference. 28-31 October 2012, Kerala, India. 72. Vu Van Truong, Le Mau Tuy, Le Dinh Vinh, Tran Thanh and Lai Van Lam (2012). The 2011-2015 rubber planting recommendation in Vietnam. International Rubber Conference. 28-31 October 2012, Kerala, India. 73. Nguyen Anh Nghia, Vu Thi Quynh Chi and Nguyen Xuan Dong (2012). Molecular analysis of Botryodiplodia theobromae isolate from rubber in Vietnam using rDNA ITS sequencing. International Rubber Conference. 28-31 October 2012, Kerala, India. 74. Kim Thi Thuy, Do Kim Thanh, Nguyen Nang, Nguyen Thi Thanh Thao and Nguyen Quoc Viet (2012). Influence of various tapping systems on rubber yield of two clones RRIV3 and PB 260 at South-East region in Vietnam. International Rubber Conference. 28-31 October 2012, Kerala, India. 75. Hoan Nguyen Thai, Jenna Malone, Peter Boutsalis and Christopher Preston (2012). Glyphosate resistance in barnyard grass (Echinochloa colona). In Eldershaw, V., (ed. ), Proceedings of the 18th Australasian Weeds Conference on Developing Solutions to Evolving Weed Problems, Melbourne, Victoria, Australia, 8-11 October 2012. Weed Society of Victoria Inc., Batman, Vic 3058, Australia, 237-240. 76. Le Mau Tuy (2013). Vietnam Rubber Group Planting Recommendation 2011-2015 and performance of RRIV clones. IRRDB Agronomy Workshop. Medan, 9th to 12th May, 2013. 77. Do Kim Thanh (2013). Salient Features of Latest Recommendations of Latex Harvesting Technology in Vietnam. The International workshop on latex harvesting technology. 18th - 22nd November 2013. Binh Duong, Vietnam. 78. Nguyen Thi Hoang Van, Nguyen Thi Hue Thanh, Nguyen Quoc Cuong and Huynh Tan Khach (2013). Response of Hevea brasiliensis (clone PB 260 and VM 515) to Low Frequency Tapping in the Initial Tapping Year. The International workshop on latex harvesting technology. 18th - 22nd November 2013. Binh Duong, Vietnam. 79. Truong Van Hai, Nguyen Nang, Luong Huu Trung, Nguyen Van Duy Nhat, Nguyen Van Tai and Nguyen Anh Toan (2013). Influence of low Frequency Upward Tapping System Combined with Stimulation on clone PB 260. The International workshop on latex harvesting technology. 18th - 22nd November 2013. Binh Duong, Vietnam. 80. Nguyen Nang, Truong Van Hai, Kim Thi Thuy, Do Kim Thanh, Nguyen Thi Hoang Van, Nguyen Quoc Viet and Nguyen Van Thai (2013). Technical and Economical Efficiency of d4 Downward Tapping Systems. The International workshop on latex harvesting technology. 18th - 22nd November 2013. Binh Duong, Vietnam. 81. Nguyen Quoc Cuong, Do Kim Thanh and Nguyen Nang (2013). Results of Gaseous Stimulation system (RRIMFLOW) on Clone GT1. The International workshop on latex harvesting technology. 18th - 22nd November 2013. Binh Duong, Vietnam. 82. Kim Thi Thuy, Do Kim Thanh, Le Mau Tuy and Nguyen Nang (2013). Potential Adoption of Latex Diagnosis for Early Selection of Hevea Brasiliensis. The International workshop on latex harvesting technology. 18th - 22nd November 2013. Binh Duong, Vietnam. 83. Vu Van Truong, Le Mau Tuy and Le Hoang Ngoc Anh (2015). Performance of the hybrid progenies derived from IRRDB’81 germplasm. International Rubber Conference. 2nd - 3rd November 2015, Ho Chi Minh city, Vietnam. 84. Le Mau Tuy, Vu Van Truong, Vo Thi Thu Ha and Lai Van Lam (2015). Vietnam rubber planting recommendation 2006-2020. International Rubber Conference. 2nd - 3rd November 2015, Ho Chi Minh city, Vietnam. 85. Tran Thanh, Le Mau Tuy and Lai Van Lam (2015). Genotype x Environment interaction and phenotypic stability of Hevea clones in traditional and non-traditional rubber growing regions of Vietnam. International Rubber Conference. 2nd - 3rd November 2015, Ho Chi Minh city, Vietnam. 86. Le Hoang Ngoc Anh, Le Mau Tuy, Vu Van Truong and Lai Van Lam (2015). Performances of polycross progenies and the implication in Hevea breeding. International Rubber Conference. 2nd - 3rd November 2015, Ho Chi Minh city, Vietnam. 87. Dao Thanh Hoi and Tong Viet Thinh (2015). Effect of silt pits on mature rubber plantation. International Rubber Conference. 2nd - 3rd November 2015, Ho Chi Minh city, Vietnam. 88. Tran Van Thanh, Tong Viet Thinh and Nguyen Van Dong (2015). Impact of light rare earth elements on yield and quality of latex. International Rubber Conference. 2nd - 3rd November 2015, Ho Chi Minh city, Vietnam. 89. Nguyen Đo Hieu, Nguyen Phuong Vinh, Nguyen Anh Nghia, Phan Thanh Dung, Vu Thi Quynh Chi, Nguyen Thi Hue Thanh, Nguyen Minh Khang and Truong Van Tuan (2015). Efficiencies of management method to oidium leaf fall disease on mature rubber trees. International Rubber Conference. 2nd - 3rd November 2015, Ho Chi Minh city, Vietnam. 90. Tran Dinh Minh, Adré Clément-Demange, Mouman Soumahoro, Aurélien Masson and Valérie Pujade-Renaude (2015). Genetic mapping and identification of QTLs involved in the tolerance/sensibility of rubber tree (Hevea brasiliensis) to Corynespora cassiicola secreted effectors International Rubber Conference. 2nd - 3rd November 2015, Ho Chi Minh city, Vietnam. 91. Vu Thi Quynh Chi, Nguyen Thi Thanh Trang, Doan Nhan Luan, Nguyen Ngoc Mai and Nguyen Anh Nghia (2015). In vitro screening of antagonistic phylloplane actinomycetes against Corynespora cassiicola fungus. International Rubber Conference. 2nd - 3rd November 2015, Ho Chi Minh city, Vietnam. 92. Nguyen Anh Nghia, Ha Van Khuong, Nguyen Don Hieu and Phan Thanh Dung (2015). Chemical control of oidium leaf fall disease on mature rubber estates in Vietnam. International Rubber Conference. 2nd - 3rd November 2015, Ho Chi Minh city, Vietnam. 93. Nguyen Nang, Truong Van Hai, Do Kim Thanh, Pham Van Luyen, Tran Vinh Tuan, Nguyen Van Thai, Nguyen Quoc Viet and Kim Thi Thuy (2015). The yield and latex physiological parameters on d3 and d4 tapping systems of PB 260 clone at Southeast region in Vietnam. International Rubber Conference. 2nd - 3rd November 2015, Ho Chi Minh city, Vietnam. 94. Nguyen Thi Hoang Van, Le Vo Ngoc Diem, Nguyen Thi Thanh Thao, Kim Thi Thuy and Nguyen Nang (2015). Low intensity tapping systems: Preliminary results on Vietmanes Hevea clones. International Rubber Conference. 2nd - 3rd November 2015, Ho Chi Minh city, Vietnam. 95. Truong Van Hai, Nguyen Anh Toan, Luong Huu Trung, Nguyen Van Duy Nhat, Nguyen Van Tai and Nguyen Nang (2015). Influences of low frequency upward tapping systems on Hevea brasiliensis clone PB 260. International Rubber Conference. 2nd - 3rd November 2015, Ho Chi Minh city, Vietnam. 96. Nguyen Thi Thanh Ngoc, Nguyen Thanh Truc, Nguyen Thi Anh Hoa and Lai Ngoc Thien (2015). New mixture of catalysts to replace selenium in the determination of nitrogen using Kjeldahl method. International Rubber Conference. 2nd - 3rd November 2015, Ho Chi Minh city, Vietnam. 97. Nguyen Thanh Truc and Nguyen Thi Thanh Ngoc (2015). Organizing proficiency testing for natural rubber laboratories – experience of RRIV. International Rubber Conference. 2nd - 3rd November 2015, Ho Chi Minh city, Vietnam. 98. Thai Hong Khang and Z. M. Ariff (2015). Study on curing behaviour of a natural rubber injection moulding article using cadmould simulation software. International Rubber Conference. 2nd - 3rd November 2015, Ho Chi Minh city, Vietnam. 99. Thai Hong Khang, Nguyen Thi Hue Trang and Tran Giang Nam (2015). The effects of carbon black on properties of rice husk ash filled hybrid natural rubber composites. International Rubber Conference. 2nd - 3rd November 2015, Ho Chi Minh city, Vietnam. 100. K. Syutsubo, D. Tanikawa, T. Watari, M. Fukada, N. B. Nguyen and T. Yamaguchi (2015). Survey of process performance and greenhouse gases emission of wastewater treatment system in natural rubber processing factories. International Rubber Conference. 2nd - 3rd November 2015, Ho Chi Minh city, Vietnam. 101. Tran Thanh, Tran Van Dung and Le Mau Tuy (2015). Effects of planting density to grow and yield atributes of rubber trees at different stages. International Rubber Conference. 2nd - 3rd November 2015, Ho Chi Minh city, Vietnam. 102. Le Thanh Loan, Nguyen Thi Hue Thanh, Le Tuan Anh, Hoang Thang Long, Nguyen Quoc Cuong and Nguyen Thi Hoang Van (2015). Impacts of low frequency tapping on productivity and production cost: A case study of rubber industry in Vietnam. International Rubber Conference. 2nd - 3rd November 2015, Ho Chi Minh city, Vietnam. 103. Van H. T. Nguyen, Diem N. V. Le, Thao T. T. Nguyen, Thuy. T. Kim, Nang Nguyen, Thanh K. Do (2016). Seasonal variation and evolution of some latex physiolgical parameters of Hevea brasiliensis over consecutive tapping years. IRRDB International Rubber Conference. 21 - 22 November 2016, Siem Riep, Cambodia. 104. Ngoc M. T. Tran and Van H. T. Nguyen (2016). Applying Composite Climatic Marginality (CCM) index to evaluate the influences of regional climate of yield potential of Hevea brasiliensis in Viet Nam. IRRDB International Rubber Conference. 21 - 22 November 2016, Siem Riep, Cambodia. 105. Pham Thi Ngoc Giau, Nguyen Bao Quoc (2017). Biological control of Corynespora cassiicola causing Coynespora Leaf Fall disease (CLF) on rubber tree by Bacillus thuringiensis (T3). IRRDB International Rubber Conference. October 2017, Indonesia.